The Slimmest cell phone wallet and stand for your smart device. 3 in 1 Silicone Mobile Holder has the answer for you — It is a phone holder, a stand and a wallet. 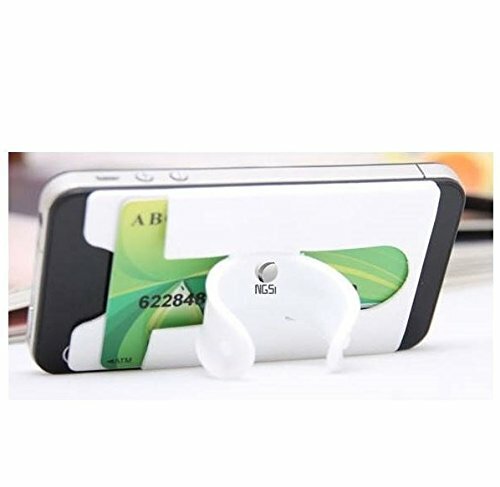 Touch the middle piece, it will curl and become a kickstand for you to watch or make videos hand-free. When you are done, just touch the two ends, the middle piece will be flat and it’s just a wallet now. Many customers use them just for the sake of convenience. Ladies, your NGSi 3-in-1 Silicone Mobile Holder will fit perfectly in your fancy handbag with your smart phone for your night out. Guys, you may just decide no more bulky wallet needed. 3-in-1 Silicone Mobile Holder is made from best silicone rubber and designed to last long time. In fact, if it doesn’t we’ll replace it free of charged, no questions asked. Order now! Click the “Add to Cart” Button before it runs out! 3-in-1 and EASY TO USE – Peel and stick to the back of your phone or phone case. Slim to-go Wallet to carry Credit Cards, License and/or Cash. Touch the middle and you will have a Stand for Your Phone. FITS MOST SMART PHONES and CASES with size of 2.25″W x 3.75″H – iPhone, iPad, iPod Touch, Samsung, LG, Windows Phone, HTC and more. Measure your phone to make sure it fits without covering your microphone or video camera. Stops your phone from sliding around on any surface, including your hands. Waoooo!!!…Amazing!!!!!! NGSi 3-in-1 Silicone Mobile Holder,is AMAZING!! !